Today we went to church, had a roast dinner and then wandered to the park before watching the Boat Race. 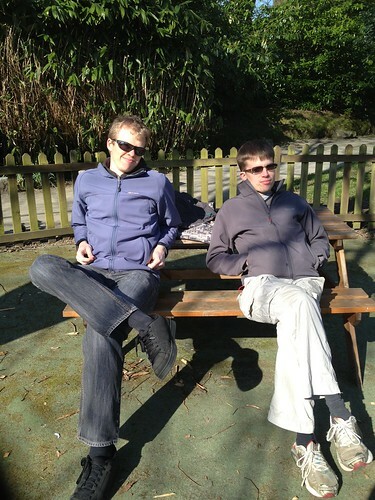 This is a typical picture of The Mister and his friend Tom, sitting and chilling out in the play park whilst the kids run about like loons. A perfect day. We are hoping the weather stays nice and sunny this week, even if it isn’t terribly warm. 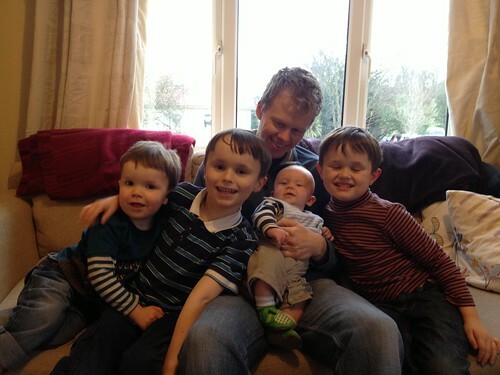 Today our friends Tom and Anne arrived with their three boys, Matthew, Andrew and Mark. They have come to help us celebrate The Little Mister’s Christening and to be his godparents. It also means that we get a little holiday with them and have a change to wander around the island beaches etc. It’s so lovely to see them and the boys have grown up so much! Morning! This was what greeted me on waking up today. I think he is looking much older than his 15 weeks, and he has a really strong neck and back. I moved him out of his Cocoon into the proper sitting up buggy. I did this because yesterday when we were out walking he was wide awake and looking around. Today however, by the time I had finished faffing about with the buggy he was sound asleep. Typical! Our little bear is such a smiler these days. He has this gorgeous lopsided grin that makes my heart skip a beat. 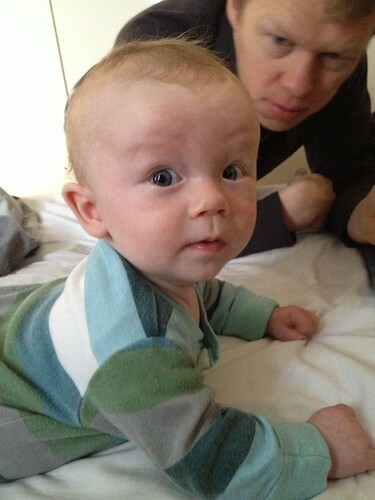 When I see his little face it makes me remember that all those disappointing months were worth it. I remember all too well the disappointment and the fear that it would never happen. We are very fortunate, that much I know. I still hope and pray for those of my friends who haven’t managed it yet. I hope they do. The wait is worth it. Whilst I am on maternity leave I am trying to have lunch with my Mum, sister and the kids. It’s nice to get the chance to try out one of the different cafes. Today we went to The Beach House a Pembroke Beach and we went for a short walk before we ate. 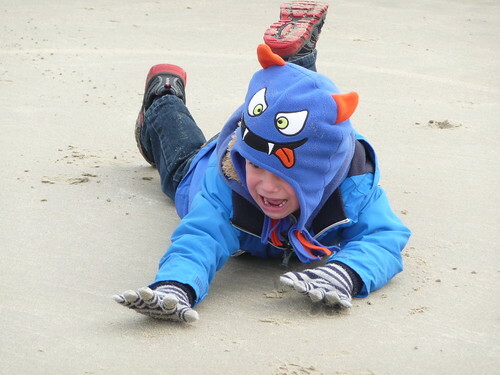 Barnabas had a slight crisis during the walk, all because his Mum was pushing his truck along the beach. It might be a little bit cruel to post this picture but it amused me because it kind of looks like his monster hat is eating his head1! The Little Mister has a new friend called Sophie the Giraffe. She arrived in the post this morning and The Little Mister already loves chewing on her nose. 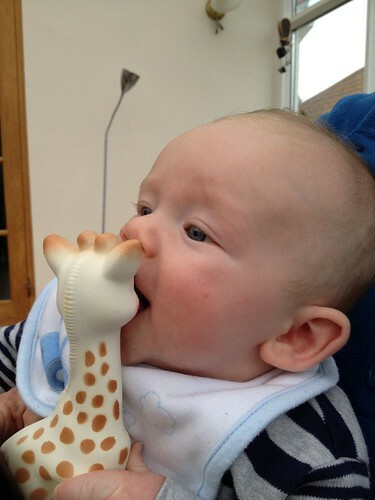 This toy is meant to be really good for teething babies as it is easy to grasp and soft to chew on. It also squeaks so it kind of reminds me of a dog toy! This evening The Little Mister rolled from lying on his tummy and pushed himself onto his back. He did it twice but refused to perform when I got the camera out! We are now making decisions about where to put our pictures and what fits on the different walls. 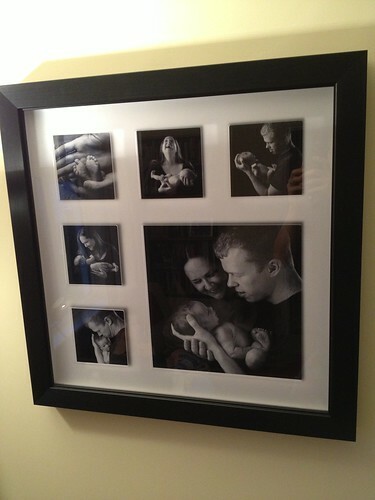 This gorgeous montage of photos was taken by Yasmin when The Little Mister was about 7 days old. He has now lost that wizened little old man look that he had when he is tiny. I am so pleased that we have photos of him when he was dinky because now he is solid and much rounder! Today we were at my parents house for lunch. 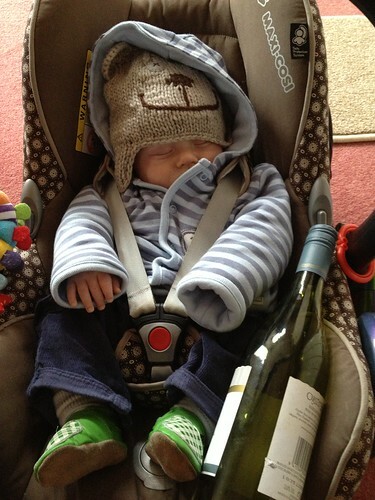 I left The Little Mister asleep in the hallway whilst we had our meal and when I went out to check on him it would seem he had been partying all on his own. I think Grandpa might have been responsible for this photo somehow because he thought it was hilarious! 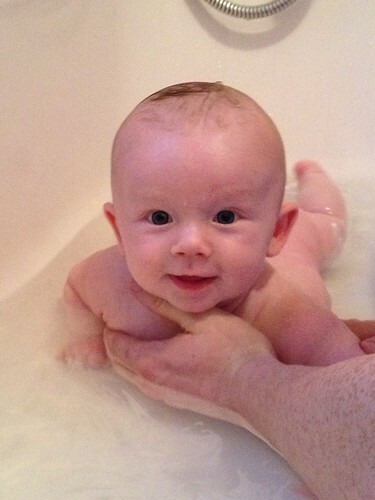 The Little Mister loves the water and thoroughly enjoys bathtime, especially when Daddy is supervising! He kicks hard and propels himself up and down the bath. We have given up with the little baby bath or any support as he just likes lying flat on his back and kicking away. I can’t wait until he starts swimming lessons in September, well he will start if I ever remember to fill in the forms which I have lost again. I must remember to go and get a replacement! I had swimming lessons as a child and I think it is so important for kids to be able to swim, especially living over here. Let’s hope he copes as well in the cold water of a swimming pool as he does in a nice warm bath! This afternoon I took The Little Mister to have some more photos done with Yasmin. 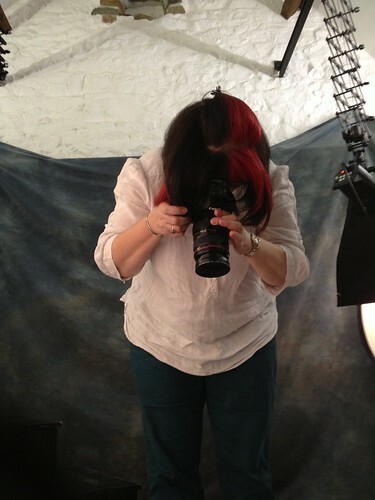 I love watching her work but especially when she is taking photos of my favourite subject. He was asleep for about half the photoshoot and protested highly to being woken up. 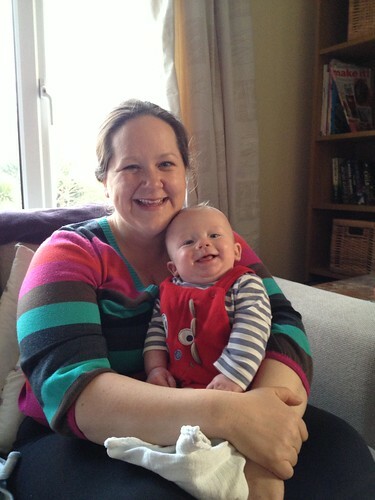 We also had a few photos done of me breastfeeding him as this is something that I really want to remember.